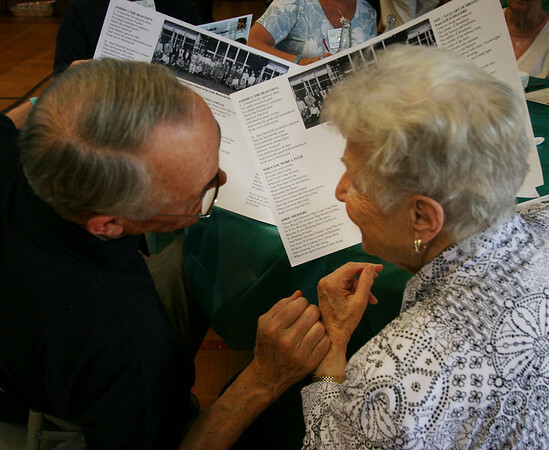 Jim Tedford, Jr., left, and Adeline Diehl sing songs whose lyrics are printed on their placemats at the Ipswich Rotary club's annual lunch for senior citizens. Photo by Mary Catherine Adams/Salem News. /|+, Jim Tedford, Jr., left, and Adeline Diehl sing songs whose lyrics are printed on their placemats at the Ipswich Rotary club's annual lunch for senior citizens. Photo by Mary Catherine Adams/Salem News.